Causa Justa :: Just Cause builds grassroots power and leadership to create strong, equitable communities. Born from a visionary merger between a Black organization and a Latino immigrant organization, we build bridges of solidarity between working class communities of color. 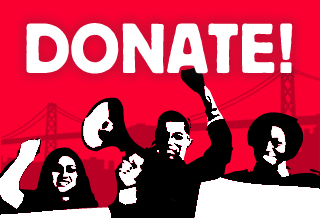 Through rights-based services, policy campaigns, civic engagement, and direct action, we improve conditions in our neighborhoods in the San Francisco Bay Area, and contribute to building the larger multi-racial, multi-generational movement needed for fundamental change. We are hiring for both a Full Time and Part Time bilingual Tenant Counselor/Organizer to provide advice and housing counseling in Spanish and English to residents several days a week to be based in our San Francisco office. • Provide tenant rights counseling including – maintaining and providing necessary case management for clients. • Familiarity with San Francisco &/or Oakland including – local history, geography of the city / neighborhoods, knowledge of various organizations, political issues, etc. Spanish speakers encouraged to apply. We are hiring for both Full Time and Part Time Positions. The FTE salary range is between $42,000-$48,000. Position is open immediately. Deadline for application is November 20th. People of color, women, and LGBTQ people are strongly encouraged to apply.